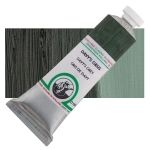 Green earth is a natural pigment that varies from yellow and olive to blue-green in its composition and hues. It is semi-transparent, has low hiding power and tinting strength, muddies and darkens in oil, and is particularly good for tempera and fresco painting. Green Earth has excellent permanence and lightfastness, although some varieties can be developed by light calcining. It is one of the most permanent pigments because Earths are not affected by sunlight or atmospheric conditions. Green Earth has no significant hazards. Terre verte is French for green earth . It was discovered in antiquity, and its use has been traced to the Ajanta caves in India and a variety of Roman sites, including Pompeii. Green Earth was very popular for underpainting flesh tones in medieval paintings because this green was the compliment to pink on the medieval color wheel. Its use declined after the Renaissance. The natural supplies of the pigment are mostly depleted, and manufacturers currently duplicate the hue using mineral bases like Viridian, iron oxide, or chromium oxide, or artificial ceramic colorants. Pigments sold under this name can also be the result of mixing Sienna and Phthalo Green.